Uganda is indeed a destination of wonders. Besides the famous Uganda gorilla trekking safaris and tours, the country has gone ahead to bring new innovations that would leave Uganda safari undertakers mesmerized. The Wildlife that thrives in various protected areas including Kidepo, Murchison, Lake Mburo and Queen Elizabeth National Parks have for long been explored in vehicles along the designated tracks which presents some difficulties at times when these animals are a bit far from these tracks and distant views seems not be rewarding. The National Park of Queen Elizabeth like how it was gifted right away from the beginning with hosting the Queen of England is at this time also the number one park to have balloon tours for travellers on safaris in Uganda. Exploring the amazing wild life of Queen Elizabeth including lions, elephants, buffaloes, side-stripped jackals, counts of antelopes among others while swinging in the air using a balloon is one of the rewarding encounters one can have while on a safari in Uganda. Gaining the impressive Ariel view of the rolling savannah plains lying on the floor of the Albertine rift coupled with the series of explosion craters in the north of the park combine to generate ultimate experience. 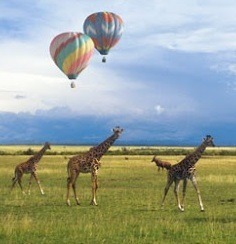 The Balloon activity operates daily throughout the year in the National Park of Queen Elizabeth. It is well set to give considerable attention to various client categories ranging from the romantic couple to large groups of Uganda safari undertakers not forgetting events of corporate and incentive nature. The duration of the flight is one (1) hour though the safari packages stretch to 3 hours including Bush breakfast. The Balloons are modern and are considerably safe with experienced pilots. The passengers can put on long pants, sturdy shoes, a hat or a cap and warm clothing and no high heels. The Balloon tours take from 2 people up to 40 people and the passenger balloons carry between 2 – 16 people in each balloon.